amazing photo. the kura are still standing. At 4:20 in the morning on July 31, 1909 (Meiji 42) a fire broke out at a knit-wear factory in Osaka’s Kita-ku, the northern part of the city. In late Meiji (1868-1912), there were only two fire engines—powered by steam—for the whole city, and most of the buildings in Osaka were made of wood. This proved disastrous. As a strong north-eastern wind drove the fire from one bamboo gutter to the next, it soon went wild. Within hours, a huge area south of Osaka station was engulfed in flames. While family and friends rushed to the burning area to help out, the terrified inhabitants threw their belongings on carts and tried in desperation to escape through the narrow streets. They were soon caught between the fire racing towards them from the north-east, and the Dojima River, which blocked their escape to the south. The area in front of the Osaka District Court, near Oebashi bridge and City Hall, was a jumble of panicked people and overloaded carts. Leaving behind the household goods they had tried so hard to safe, they barely managed to escape with their lives. Four employees of the Court, however, didn’t escape in time and perished in the fire. In the middle of the area overrun by the greedy flames ran the Shijimi River (蜆川), flanked by brothels, and the countless tea houses where the geisha worked. Many of the people who lived or worked along the river, threw their belongings in boats and attempted to escape over the water. It was a narrow river, just 5 meters wide, with ten bridges crossing it. At several locations, such as at the Yanagi Bridge, many of the boats got stuck and people struggled desperately to make it out alive. Jumbled boats on the Shijimi River. The river was filled with the debris of the fire and is now a street full of neon light in Osaka’s Kita Shinchi entertainment area. Many of the richer people in the area stored their valuables in big white kura (倉, traditional Japanese storehouses). Made of thick mud walls and with few, if any, windows, they are designed to withstand fires like the one that was raging. As the furious fire quickly encroached, people hurried to seal the openings along the kura-doors with mud or rice-bran paste. This saved them. When the fire was finally put out some 24 hours later, the kura were the only buildings left standing, as can be seen on the top image. The huge fire, now known as the Great Kita Fire (キタの大火) or Tenma Fire (天満焼け) was a terrible disaster for Osaka. Twelve people lost their lives, some 177 were wounded. 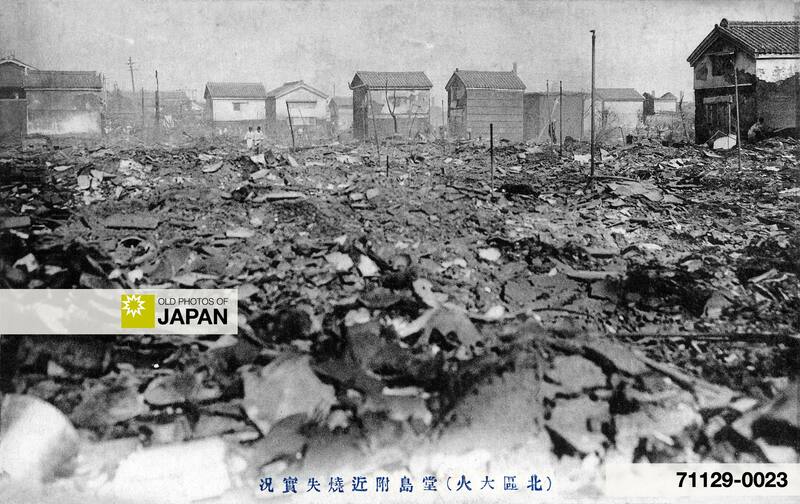 No less than 11,365 houses and buildings were destroyed, among which the Osaka District Court, the Governor’s Official Residence, the Dojima Rice Market (堂島米殻取引所)—the nation’s largest—, the Kita Ward Office, 8 schools, 20 temples and shrines, 4 banks and 10 company buildings. 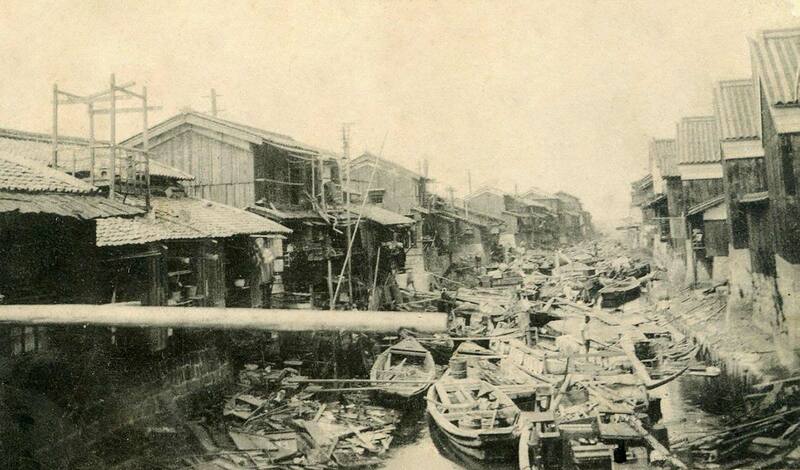 Eleven bridges were also destroyed, including the important Oebashi Bridge (大江橋) across the Dojima River. An area of 122 ha. had been reduced to ashes. The disaster completely transformed northern Osaka. The old traditional architecture disappeared. The majority of the people working in the burnt down district had been geisha and rice brokers, the unique character they gave to the area vanished forever. The romantic Shijimi River, which featured in dramatist Chikamatsu Monzaemon‘s (近松門左衛門, 1653-1725) famous play The Love Suicides at Amajima1 (心中天網島, Shinjuten no Amijima, 1720), was filled in with the debris of the fire and eventually disappeared completely. Gas lamps were banned and replaced by metal ones. It persuaded local authorities to more enthusiastically promote the use of electricity, something which still scared many people. They believed it caused paralysis. Map showing the approximate area devastated by the Great Kita Fire. 1. Start of fire; 2. Oebashi Bridge. For more information about fires in 19th century and early 20th century Japan, read Yokohama, 1890s • Dezome-shiki. The Google map below is centered around Oebashi Bridge. 2 Yomiuri Shimbun Shakaibu (1987). Scenes of Naniwa: Osaka Time Tunnel. Warajiya Publishing Co., Ltd, 81-88. You can also licence this image online: 71129-0023 @ MeijiShowa.com. Amazing that only 12 people died. I wonder if after the fire that they used less wood in their structures. Considering the number of people that lived and worked in the area, the size of the afflicted area and the strong wind, I thought the number of dead was relatively small, too. I haven’t been able to confirm yet how much less wood was used. But there was certainly less. Sadly, this area burnt down again after it was fire bombed during WWII. @Tom Burke: That was not always the case after a huge fire like this. I am really curious about the condition of their contents!